My friend Carol makes these every Christmas, and my mouth waters at the thought of those cookies. Next time you see these at a party, or in a bakery, you must try at least one. You won’t be disappointed! They are thin, crisp and often flavored with almond, anise, or vanilla. You will see them around the holidays, although they are appropriate at any time of year. They are created like a waffle and usually are about 4″ in diameter. Each cookie is individually pressed. The result is that each cookie has it’s own look with ragged edges that are a little crispy. I like them plain, but the chocolate version is good, too. For variations, you can roll them into tube or canes shapes when they are warm, dip them in chocolate, or sandwich filling in between two cookies. 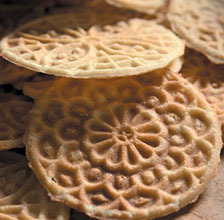 Thanks to King Arthur Flour for the photo, they have a good pizzelle maker, too. Posted in Cookies, references, recipes. Bookmark the permalink.